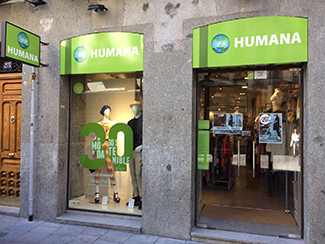 Now that 30 years have passed since the creation of Humana and the opening of the first sustainable fashion store of the entity, the Foundation has inaugurated a new shop in Madrid. It is located in the central Corredera Baja de San Pablo, number 23, near the Gran Via and Plaza del Callao. At present the number of stores in Spain is 44: 22 in Madrid, 18 in Barcelona, 3 in Seville and 1 in Granada. Humana gives a second life to used clothes, turns a residue into a resource, drives sustainable fashion and transforms it into a circular one. Because there is no more sustainable garment than the one already manufactured.